Dateline: Santa Clara, CA (8:45 am PDT) — In prefacing this, the news that the U.S. Dept. of Justice special prosecutor Robert Mueller investigation was announced last Friday, that an indictment, or indictments have been handed down from the sequestered grand jury in the investigation to the U.S. Eastern District Court of W. Virginia. Who or whom are to be indicted is up to speculation given the many who are considered highly suspect — Trump 2016 presidential campaign officials and possibly current officials holding office. ..your capitulation to ANY point n debate has been duly noted with that cranial rectal ad hominem ..incl. one’s psychological projection ..
“Sticks and stones …” however, this Tweeter may not be what one could construe as an individual exercising their 1st Amendment right, and even a sane opinion. 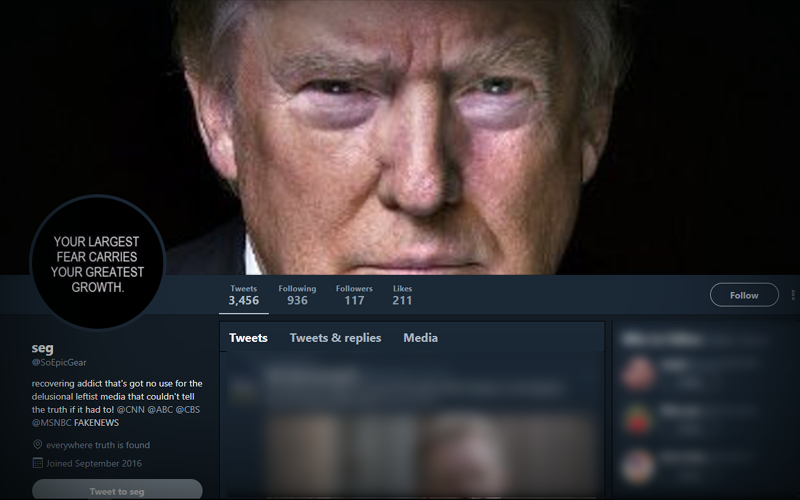 It also appears to be one of a unique & despicable character/nature whose Twitter-blog feed (originating out of Istanbul, Turkey) just may be part and parcel of the #FakeNews #TrumpRussia “bot” effort that used American social media to affect the last General Election. Moreover, given the context and content of the re-Tweets colleagues have noted that it’s possibly be a some un-bathed & poorly clad foreign technical insurgent in a call-center, or cellar of a data mining combine in Eastern Europe or W. Asia. Though never thought to catch one “in the wild,” and without going into technical script detail, the fonts used, URL(s), trace_route analytics and of course the “vile” nature of the behavior of this “bot,” it’s not one to ignore,’ or even to “block,” but to marvel at it’s simplicity and how technology has offered a means by which a hostile and foreign government and or entities can affect even a young progressive democracy. Such as the United States of America. “Life” it is said is ‘too short.’ And with the Mueller investigation entering yet another phase into the hacking of the American election, and possibly at the State and local levels as well, it is this sort of interaction that provides further information of the “Clear & Present Danger” to the Republic …by ‘Fancy Bears‘ ..
← FB: Now We Know Why ..